The Yamato class battleships(大和型戦艦,Yamato-gata senkan) were battleships of the Imperial Japanese Navy (IJN) constructed and operated during World War II. Displacing 72,000 long tons (73,000 t) at full-load, the vessels of the class were the largest, heaviest, and most heavily-armed battleships ever constructed. The class carried the largest naval artillery ever fitted to a warship, nine 460-millimetre (18.1 in) naval guns, each capable of firing 2,998-pound (1,360 kg) shells over 26 miles (42 km). Two battleships of the class (Yamato and Musashi) were completed, while a third—Shinano—was converted to an aircraft carrier during construction. Due to the threat of American submarines and aircraft carriers, both Yamato and Musashi spent the majority of their careers in naval bases at Brunei, Truk, and Kure—deploying on several occasions in response to American raids on Japanese bases—before participating in the Battle of Leyte Gulf, as part of Admiral Kurita's Centre Force. Musashi was sunk during the course of the battle by American carrier airplanes. Shinano was sunk ten days after her commissioning in November 1944 by the submarine USS Archer-Fish, while Yamato was sunk in April 1945 during Operation Ten-Go. On the eve of the Allies' occupation of Japan, special service officers of the Imperial Japanese Navy destroyed virtually all records, drawings, and photographs of or relating to the Yamato-class battleships, leaving only fragmentary records of the design characteristics and other technical matters. The destruction of these documents was so efficient that until 1948 the only known images of the Yamato and Musashi were those taken by United States Navy aircraft involved in the attacks on the two battleships. Although some additional photographs and information from documents that were not destroyed have come to light over the years, the loss the majority of written records for the class has made extensive research into the Yamato class somewhat difficult. Because of the lack of written records, information on the class largely came from interviews of Japanese officers following Japan's surrender. This new Fumimi kit came as a bit of a surprise to me. One because I had not heard it was coming and the second is the scale in which it is build. However, I can fully understand why 1/500 was chosen as even at this scale, the hull measures 21 inches in length. One can only imaging how huge and expensive a 1/350 new tooling would be. As the majority of Japanese kit sales is in Japan, this also makes sense as display space in most Japanese homes is at a premium. 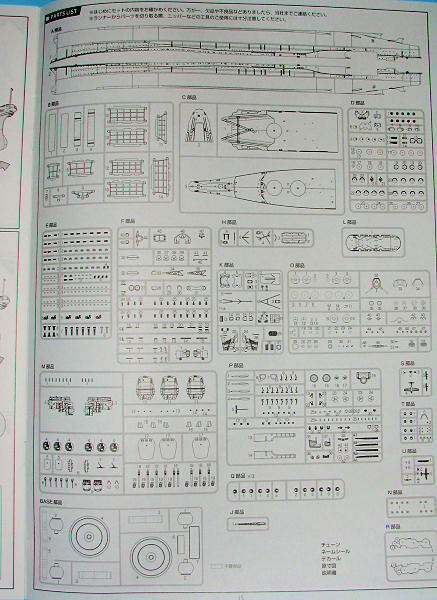 Fujimi has designed this kit in the same way it did its large battleships. it also packaged them well as the hull halves are firmly held in cardboard to prevent damage. There are sturdy bulkheads in between the hull halves to ensure proper alignment. 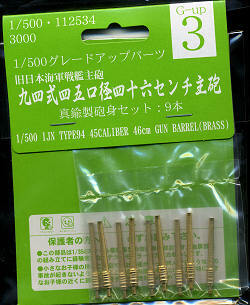 The kit also includes nine superbly turned brass gun barrels that simply slot into the hinged areas in the turrets. The deck is in three sections, a large foredeck, a smaller amidships section and the lowered deck that has the floatplane well. There are a lot of parts to the kit as it seems just about everything is separate and needs to be glued in place. This includes the myriad of deck fixtures and since this is the 1945 outfitting, there are tons of AA guns to attach to the deck. Of course, this means that the large triple turrets on the sides of the main superstructure are not there, but I'll bet there is aMusashi kit in the works that has these items. Though there are a lot of parts in this kit, it seems to me that it won't be difficult to build. 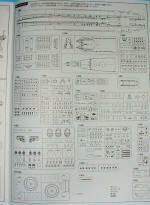 The instruction booklet is quite large and has well drawn construction steps. It is engineered to where many of the parts can be done as subassemblies and then attached at a later date. Decals are limited to names and flags, but there is what appears to be a full scale set of color painting and markings drawings in full color to help out. Overall, it looks to be a superb ship. I have been told that Fujimi did a 1/500 Yamato in the past, and well, this isn't the same kit. If you'd like an impressive kit to display that won't overwhelm your display space, then I can highly recommend this one to you. My thanks to www.dragonmodelsusa for the preview kit. Get yours today from your local shop or have them order it for you.